» A Movie Review by Walter Albert: THE DUCHESS OF BUFFALO (1926). A Movie Review by Walter Albert: THE DUCHESS OF BUFFALO (1926). 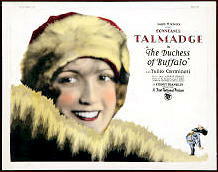 THE DUCHESS OF BUFFALO. First National Pictures, 1926. Constance Talmadge, Tullio Carminati, Edward Martindale, Rose Dione, Chester Conklin. Screenplay by Hans Kraly based on the play Sybil by Max Bordy and Franz Martos. Director: Sidney Franklin. Shown at Cinevent 40, Columbus OH, May 2008. The beautiful Constance Talmadge plays Marian Duncan, an American dancer who’s touring Russia and leaving broken hearts in her wake. She’s fallen in love with a young lieutenant (Tullio Carminati) but she’s caught the attention of an aging roué (Edward Martindale), a Grand Duke who’s also the commanding officer of the hapless lieutenant. This is a tightly constructed romantic comedy, highlighted by a lengthy climax in which the lieutenant, Marion, the Grand Duke, and the Grand Duchess play an elaborate game of musical chairs in a hotel suite, a classic drawing room comedy situation that brings this witty play to a resolution that pleases everyone except, perhaps, the Grand Duke.